Facebook recently introduced a replacement for the old "Like" button, which now includes several other expressions besides "Like": "Love," "Sad," "Angry," "Haha" and "Wow." The current look of these emoticons is pretty standard, one might even say boring. 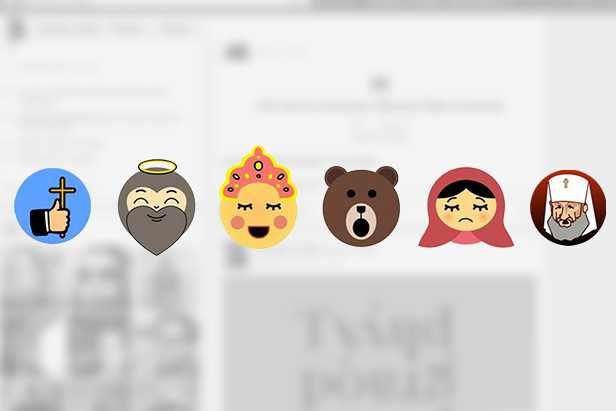 One Russian Facebook group – "Obrazovach"– has adapted these reactions to make them more fitting for a Russian audience. When you approve of something. A reminder that God is everywhere and you should remember to go to church soon. When it's more than just a like. Praise the one and only God and his son Christ. You definitely should go to church as soon as possible and atone for your sins and mistakes. Seriously. It is so funny you could end up rolling on the floor. But since you are Russian, you will make do with a simple chuckle. Other meaning: You have done something stupid, but resolved to laugh it off timidly. You have a trained bear and you are not afraid to use it as intended. When Like is just not the right option. You are from a backwoods village, and even little things can make you sorrowful. Hate or disgust for something or someone. You are an Orthodox priest and someone is snoring violently in the middle of church mass. It's infuriating.